These dark blue exterior double doors are made to look even bigger because the double doors on the second floor fill the same archway. 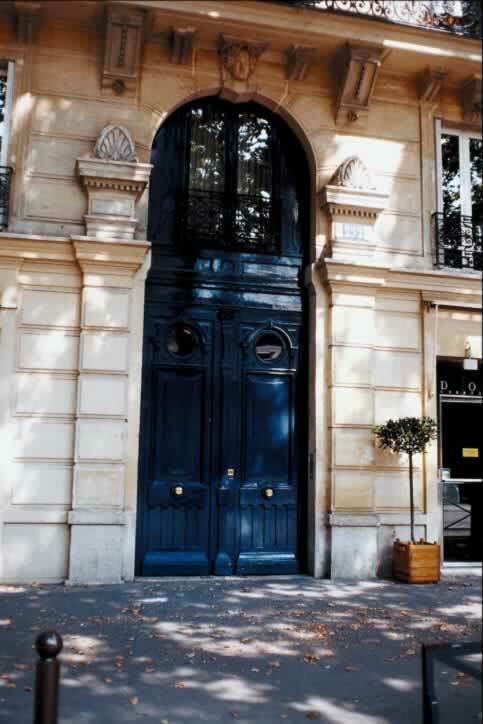 The second doors, as well as the transom (the wood between the doors and doors above them) and the enframement of both are all painted the same shade of blue. This creates one giant arch set into the stone building. The archway is flanked on either side by raised blocks that create the appearance of squared columns. Each of the lower doors is a three panel design. The top panel has a port or round window and is surrounded by molding. The center panel is the largest, and it is raised. The third and bottom-most panel have alternating raised and recessed vertical members that result in a wainscoting effect.